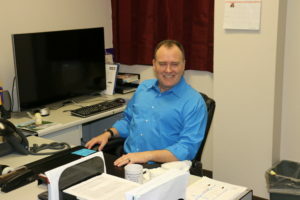 Management instructor Cary Winsett loves his job getting to teach and engage his students at Tarleton State University. 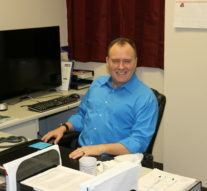 He lectures for three face-to-face classes, one of which features almost 70 students, as well as manages two online based courses. He is also legally blind. Winsett was involved in an accident on June 9, 2015, while using a cleaning agent to unclog a drain, which blew up in his face, leaving him with third degree chemical burns that resulted in a complete loss of sight. In the time that has passed since the accident, Winsett said that there has been minimal change in his visual perception. “I have since had a little bit of vision that has returned in my left eye, but it is only shapes and colors, no details,” said Winsett. Even though the accident took his sight, it was not successful of robbing Winsett of his commitment to his students or his passion for teaching. However, this isn’t to say that Winsett hasn’t had to adjust how he approaches the classroom. Winsett said that placing more emphasis on different areas of the classroom experience has been necessary to accommodate for his loss in vision. Instructor Winsett continues to have high spirits despite losing his vision. Photo by Forrest Murphy, Texan News. Winsett said the most difficult aspect of teaching now is not being able to see his students. “When I’m up at the front lecturing, I have this big area and can’t see anyone, so when I’m teaching, even when I know my students are there, it’s like I’m lecturing to an empty classroom,” said Winsett. For Winsett, he has not only had to adapt in the classroom but also in much of his day to day routine. Even with all the change Winsett has faced since losing his sight, his innate sense of optimism has persevered, allowing him to not only find the silver lining in his own situation but opportunity to help others, namely students on Tarleton’s campus. Winsett says that when he gets his vision back, he plans to conduct a lot of research into those with both low vision problems as well as blindness. Believing that there is a “great teaching opportunity” to communicate with people such individuals, especially students. Winsett insists that his work improving the learning experience for those with low vision and blindness is only the beginning. With doctors telling him that more surgery this coming year has the potential to give him most of his sight back, Winsett is determined to make a difference, armed with his natural sense of optimism and a new perspective. “Over the years, I’ve had students that have either had low vision or those that were completely blind, and I’ve lectured and treated them the in the same way as a normal student, but they don’t perceive it that way, and it took me having this to understand that. So, now I want to take this and really change the way that I deliver education to the students with vision impairment,” said Winsett. Taking everything he has learned from his own experience, Winsett believes that the future is bright, not only for himself, but also for those he is determined to help.“Out of adversity comes true inspiration,” said Winsett. God bless his sweet heart. Didn’t know about the explosion. I worked with him years ago at the hospital. Sending him lots of prayers and a hope that tomorrow is filled with multi blessings. Keep on keeping on. You and God definitely have this.